Last year, comic-book legend, John Byrne set out “to explore strange new worlds” within the Star Trek universe, using a unique technique, the photonovel. The resultingStar Trek Annual 2013, which is completely sold out through Diamond and headed for a second printing, was a creative success due to this distinctive storytelling device. This May, Byrne will continue his quest “to seek out new life and new civilizations” using the photonovel format to produce an ongoing bi-monthly series, Star Trek: New Visions. Each issue of this all-new series will be an extra-length affair.New Visions begins by going through the looking glass to tell the story of what happened after the classic “Mirror, Mirror” episode of the original series. 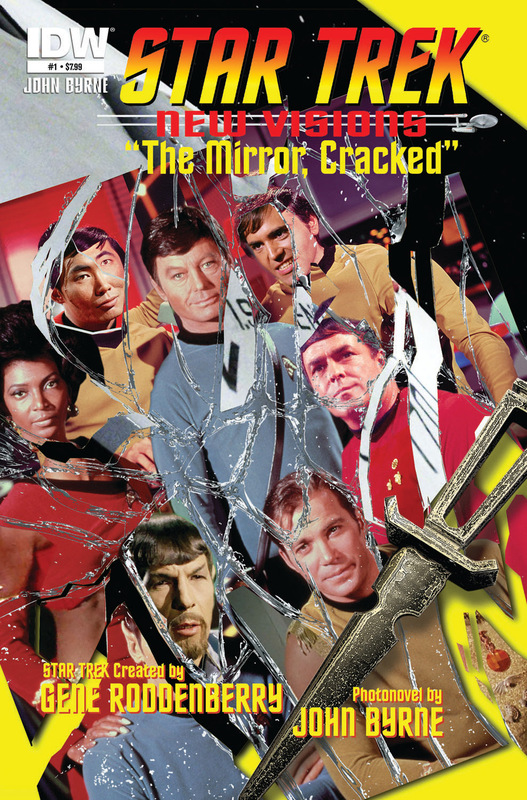 In issue #1, “The Mirror, Cracked,” the crew of the Starship: Enterprise discovers two strangers in their midst, and things take a turn when they learn that one of them has made a pact with one of James Kirk’s oldest foes.